Collectible Cat Book, Do Cats Have ESP? 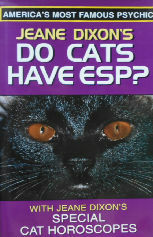 This book by Jean Dixon, the well-known psychic, explores the question of whether cats have "extrasensory perception". She recounts stories of cats who traveled long distances to the new home of a former owner, fables and myths and her own experiences. There is a section called Catscopes which includes horoscopes for cats. Hardback, copyright 1997, 108 pages, illustrations throughout. Previously owned but in good condition.